Slim Fast is a weight loss program that substitutes cooked meals with shakes and bars. The program is over 25 years old, and is currently a brand owned by Unilever. Slim Fast has been a popular choice for weight loss with it’s huge range of weight loss shakes. However in recent years, Unilever has struggled with declining sales – at first blaming the popularity of Atkins. The original Slim-Fast shakes were criticized for being too high in sugar. This was rectified by replacing sugar with the artificial sweetener Splenda. 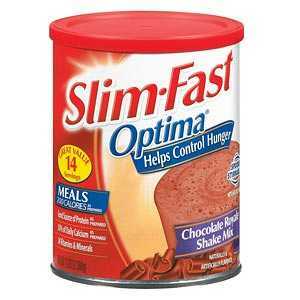 The new range of Slim-Fast products are called Optima. The diet involves replacing two main meals with Slim-Fast products. Each day will also include one “Sensible Meal”, and fruit/vegetable snacks. A sensible meal is based around a lean protein (such as skinless chicken breast, or fish), carbohydrate (potato, rice, or whole wheat bread), and a large serving of vegetables. One slice low fat pound cake OR Peanut Butter crunch Snack bar. Find other healthy low Calorie recipes here. Are Slim Fast Users Successful? The Slim Fast diet is a sensible and workable plan, and many people find the convenience of using meal replacements outweighs other diet plans. However, long-term, results using Slim Fast and other meal replacement diets isn’t common. Can I switch roast beef with ham or turkey deli? R there other options for dinner besides chicken? Has anyone tried the zigzaging suggested on the diet calculator and does it work? there used to be these slimfast bars, the traditional ones, they were the best. these are called optima now. the snak ones were great. they discontinued. i always lost weight with them and now i cant get them from anywhere. they were square sized ones with red label, says slimfast lunch and breakfast meal option ontop. lower in calorie. and i think those were the first slimfast snacks made. aaahhhhh wish i could find them. i dont like these new snacks. they have too much carb and calorie , which i dont find helpful. its just too much. !!!!!!!! Hi everyone. I started slim fast April 29, and so far have lost 17 pounds. And I do go out to eat at least once a week, you can’t deprive yourself. And I also only weigh myself once a month, I think it’s better that way, after that time of the month, I just feel it makes a big difference. I started the Slim Fast diet about a week ago. I work out every day at the gym for about an hour and a half to two hours, and every few days do about 45 minutes of Zumba. I’ve been doing relatively well. The one thing I’m worried about is after I reach my goal weight. I’m worried that once I stop drinking slim fast, I will gain my weight back. Once I’m at my goal weight, I will obviously make sure all of the food I eat is very healthy and sensible choices. No more junk/fast food. Will this work? I’m just so tired of feeling like a pariah because I’m overweight. So, if I generally eat a low calorie diet and continue exercising on a regular basis, will I be able to maintain my ideal weight? Hi there, I started Slim Fast 4 days ago-I broke last night and had sweets etc but I’m back on it again today. I want to lose 16 lbs, I would like to hear from anyone else who has slipped up and got back on it. I started this diet three ago and lost 10lbs. For coffee lovers the mocha, vanilla, and choc. taste great in your coffee and you dont have to add the extra calorie with creams or milk and sweetners.